All last week, IFC aired a 6-part document on the history of Monty Python's Flying Circus, "Monty Python, Almost the Truth (The Director's Cut)." The group had a profound influence on my own early life and tastes. 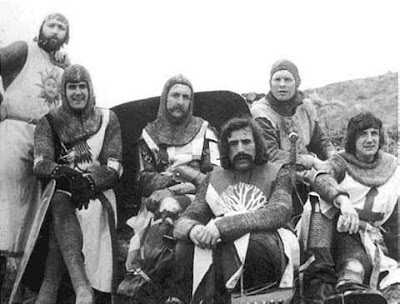 I discovered Monty Python at the perfect time: the show first started syndication in the U.S. around 1975, which would have put me just at the start of my teens. I vividly recall being somewhat puzzled by the first episode I saw but intrigued. Fortunately, I stuck with it and slowly began to "get" what they were doing and, of course, quickly became an avid fan. If I recall correctly, I had only recently discovered the television show when Monty Python and the Holy Grail was released. The movie obviously made me a fan for life—I recall it being one of the first movies I ever saw without my parents and with friends. It also was the first time I recall truly laughing aloud at a movie. (I recall one of my friends accidentally doing a spit take of his soda onto an audience member in the row in front of us during one hilarious sequence—after that, we learned to sip our sodas with our eyes closed.) Being the typical fanboy, I went on to devour whatever I could by the group, including their books and comedy albums, and being excited by their other projects, such as All You Need is Cash (the Beatles' parody Rutles mockumentary by Eric Idle). I even began producing my own homemade brand of Monty Python books for myself and my brother! As I said, I was certainly the perfect age and demographic for Python—by the time I started college, spontaneously reciting and re-enacting Monty Python lines and skits became a quick way to connect and bond with new friends. Calling the Pythons the Beatles of comedy has become a bit of a cliche recently, but it's nevertheless an apt and concise description: in the same way the Beatles reinvented and redefined rock 'n roll music and the music industry (even the album concept), the Pythons completely redefined the boundaries of humor, pushing comedy in new directions. 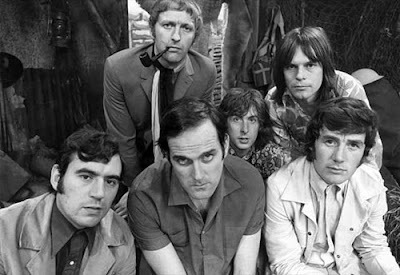 And as the Beatles internalized their love of early American rock, the local Liverpool skiffle scene (as well as a bit of the English beer hall tradition), and turned it into something new, Python built on the work of innovative comedy groups like the Goon Show and brought this subversive surreal comedy into the mainstream. (Indeed, many of the Pythons worked concurrently on many of the British shows at the time before coming together to create their own show.) Many comedy shows, and practically every comedy skit show, are clearly Python influenced. It seems fitting that the Beatles were fans of Python (and vice versa) and, as shown in the IFC documenatry, that their lives intersected substantially in many ways over the years. Being familiar with the group, aside from the details there's not much new information in the documentary for me, but in the same way the Beatles Anthology documentary was the band's way of cementing their legacy on their own terms, Almost the Truth serves the same function, while also serving as validation of their importance to fans like myself. I always have been fascinated by the fact that the Pythons were all well educated, primarily coming out of Oxford and Cambridge (which has produced similar formidable respected comedians and actors like Emma Thomson and Hugh Laurie). You can see this reflected in their humor, which is incredibly verbal and littered with literary and historical references that you either get or don't. And though it's always a risk to dissect comedy, I've always enjoyed hearing how the several camps within the group certainly recognized they had their own styles of humor and strengths; but again like the Beatles, the sum of the whole added up to something much more than their individual parts. Anyway, here's to Python. Watching the documentary and rewatching the shows have reminded me of how exciting it was to discover Python for the first time, and how much a role it played in my life when I forming my own sense of humor and identity. To see a slideshow of photos from the event described below, click here. I had the great privilege to attend the annual banquet of the Cartoon Arts Professional Society (CAPS), of which I'm a member, this past weekend. 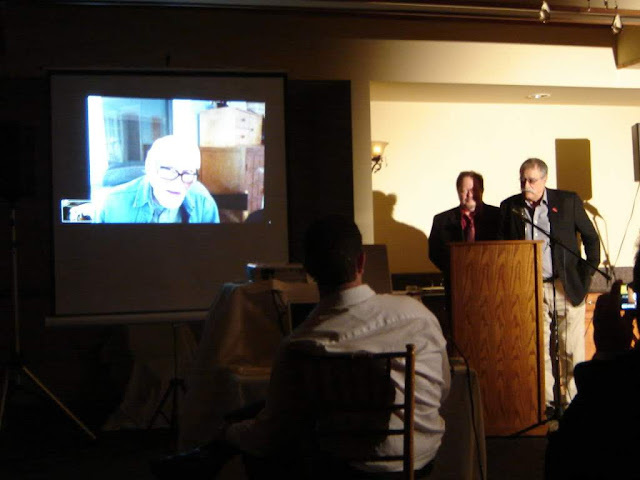 Although CAPS has thrown these banquets for many years since it's founding in 1977, several years ago the group renamed the award given at the event the Sergio, for Mad cartoonist Sergio Aragones, a founding and longtime core member of the group. 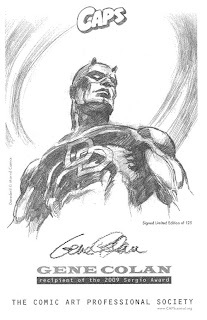 This year's Sergio went to legendary comic-book artist Gene Colan. It was a great dress-up affair; the food was terrific, and among the attendees were Aragones, June Foray (a past honoree), Stan Freberg (another past honoree), Bill Morrison (who MC'd), Stan Sakai, and Scott Shaw! Speakers included Gerry Conway, Mark Evanier, and Marv Wolfman. Conway and Wolfman touchingly spoke about how Colan's artistry made them better writers, both of whom worked with Colan early in their careers. Original art by Colan was on display at the dinner, and a tribute book was assembled for the honoree. An outstanding professional-quality video tribute was also put together by CAPS president Pat McGreal and played at the dinner. The video included glowing tributes by Dave Gibbons, Batton Lash, Rob Liefeld, Jeph Loeb, Jeff Smith, and, of course, Stan "The Man" Lee, as well as others. Numerous photos of Colan's family and of his childhood were included in the video, provided by Colan's wife, Adrienne. A nice video tribute was also provided by Marvel Comics Editor in Chief Joe Quesada. CAPS member Bill Morrison MC'd, bringing the same style and comedy he has brought to his work as MC of the Eisner Awards. The honoree, Gene Colan, was touched by the award and in his gracious acceptance remarks, acknowledged the people he had worked with, the fans, and CAPS. But what made this year's tribute particularly impressive and memorable was the fact that the guest of honor actually was not in attendance—due to health reasons that have been public knowledge, shortly after he accepted CAPS' invitation, he told the group that his doctor had advised against him traveling to California from his home in New York. So taking advantage of modern technology, using Skype, CAPS (through the tech wizardry of member Stephen Silver) was able to patch Colan in through a video-audio hook-up!! Colan and his wife were projected from a laptop onto a screen and hooked up to the room's sound system, so they were able to see and hear the whole proceeding (see photo above)! Everyone was amazed by the quality of the link from 3,000 miles away, saying it was like a NASA hookup or a remote telecast during the Academy Awards. A special surprise was during the presentation of the actual award. CAPS had secretly sent the engraved award to Colan's wife, so when the presentation was made at this end, his wife handed him the Sergio statuette—Colan was genuinely surprised and delighted. After the formal program ended late in the evening, Colan stayed on so that individual attendees could sit at the terminal and speak with him and congratulate him personally. All the guests also received a special edition endplate of an original piece by Colan, individually numbered and personally signed by the artist (see picture above right). It was another classy event for CAPS from start to finish. Another blog about the event can be found at the blogs for Mark Evanier and Marv Wolfman. As promised in my previous blog, today at my webcomics site (rhadventures.com) I begin posting never-before-seen stories from my series, Rob Hanes Adventures, that date back to the 1980s! The first self-titled story went live in its entirety today. Then on Friday, the second story will begin serializing, with a new page appearing every Monday, Wednesday and Friday. After that story concludes in early November, the third story will begin. As noted earlier, these stories—"Rob Hanes," "Loyalties," and "Koman"—were the first completed that were intended for publication, and were used to show to potential publishers. I say "intended for publication," because as anyone familiar with my work knows, the character was actually created in the mid-1970s and envisioned as a syndicated comic strip patterned after classic adventure strips like Terry and the Pirates (samples of these early efforts have appeared periodically in the comic-book series). By this time, the independent/alternative comics movement was in full swing, which also probably provided me some additional impetus to work on the series. Up until the '80s, with a few rare exceptions, comics primarily featured only superheroes and consisted of pretty much only two publishers, DC and Marvel, which limited one's options. However, the rise of the direct-sales market in the '80s, and the appearance of independent publishers which produced more alternative work like Cerebus, American Flagg, and Love and Rockets, gave me some hope that there might actually be a niche for the series. When I completed these stories, I sent proposal packets to numerous publishers. As mentioned in my earlier post, Renegade Press actually picked up the series. Unfortunately, the company went under in 1988 before the first issue was released. These early efforts obviously are the work of a different artist—the work is much more cartoony and, as one can see, I wasn't using zipatone shading yet, so the work is pretty stark and flat. Though the figurework is expressive, it's still rather stiff and a lot of the proportions are off—Rob's head and the head of the female lead, Samantha Archer, seem a bit too large in some shots (not helped, admittedly, by the very '80s mullet cuts featured in the stories). The inking is nothing to write home about but at least fairly clean. (I think I was primarily using a waterproof rolling ball writer at the time). Hey, it was a start! As for the story, while again perhaps not as polished as my work today, I must admit that in re-reading it, I find the story and dialogue fairly concise and to the point: Rob's character and his reputation at the agency and his relationship with his boss, Gabriel Evans Girard, and with his co-workers at Justice International are fairly sharply defined. And I wrapped it all up in only 16 pages! Since most comics are by design a periodical/serial medium, comics fans tend to get fixated on continuity and consistency. As such, I don't consider these stories official series canon, not only because they were a freshman effort but also because of some inconsistencies longtime readers will notice the stories have with the current continuity. For example, the main "villain" of this piece is Jarret Cox, a fellow agent at Justice International. 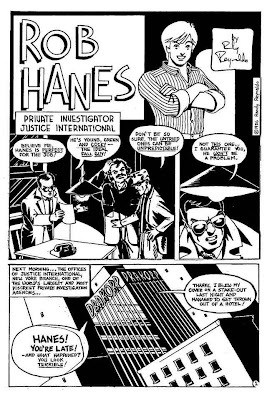 Anyone familiar with the current series will know that Cox is currently a major recurring character in the Rob Hanes Adventures universe: he is one of Rob's primary CIA handlers who, though he still has it in for Rob, nevertheless is not a corrupt turncoat as he appears in this first story. I always liked Cox's character design and the natural tension he brought as someone who didn't like Hanes, so when I decided to re-boot the series early on, I made Cox part of the regular cast of secondary characters. Cox's two henchmen, seen in the very first pages of the story, are also minor secondary characters (click on the page image above to see the characters in more detail). The one with the thin shades is Clemson, seen intermittently in the current series as a lieutenant to international crimelord Nicolai Korda (Clemson's backstory describes him as a former CIA agent, though I'm not sure that's ever been explicitly revealed in the series); the other character, with the curly hair and mustache, is Rocco. Though he hasn't appeared much in the current series aside from "Introducing Rob Hanes" which appears in the Rob Hanes Archives trade paperback collection), he was actually among the first characters ever created for the series and appeared frequently in earlier story outlines before I began working on the series as a comic-book series. Always intended as a kind of mob-type enforcer, his calling cards were that he never spoke and always wore a leather leisure-suit style jacket. 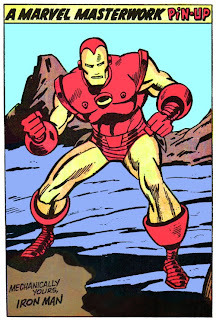 Remember, I created him in the '70s, but I must admit this look still suits the character! Anyway, as I have said, these stories are presented purely as an historical curiosity: while it's certainly rough and amateurish, at least it's clear that I've come a long way since these early efforts! Next up, I'll talk about the second story, "Loyalties." Beginning October 12, I'll be posting at my webcomics site—rhadventures.com—three stories dating back to the late 1980s that have never appeared in print until now! In order, the stories include the introductory self-titled "Rob Hanes" (from 1986), "Loyalties" (1986), and "Koman" (1987). The first story will be posted in its entirety, and the others will immediately follow in serialized format, on a schedule of about three pages a week (Monday, Wednesday, and Friday). Though most of my earliest efforts on the series appeared in the zine—which were subsequently collected in the Rob Hanes Archives trade paperback—these first three stories were never released. While I initially planned to use the stories as fillers, by the time the series was in full swing, the level of my art had moved so far along, I felt those earlier stories were no longer representative of where I was as an artist, nor met the current standards of the series. Plus, portions of the story were no longer part of continuity. In any case, after a fan of the series recently expressed interest in seeing these early stories after becoming aware of them, I went back to the files to take a look at them. While the art, of course, is the product of a very young artist still learning his way, and I certainly would not be comfortable releasing them within my current comic-book series, I felt the work was publishable, even if just as an historical curiosity. As such, I am pleased to finally let these earliest Rob Hanes stories see the light of day. For you completists, I haven't decided yet whether to make the stories available as a one-shot special edition! I've written a few times about the influence of Will Eisner and, particularly, his seminal serio-comic series, the Spirit, on my own work. Earlier this year, DC Comics completed its quarterly 26-volume hardcover compilation of the series' full run from 1940–1952. (The last volume collected the odds and ends of Eisner's intermittent work on the character from its cancellation in 1952 through 2005 shortly before Eisner's death.) In addition to the first volume, I ended up picking nearly the entire collection from about volume 13, when Eisner returned to the series after an intermittent absence from the series due to his Army service during World War II. After the series ended in 1952, however, Eisner went on to pursue other opportunities. Although he remained a working cartoonist, he left mainstream comics to focus his energies on the American Visuals Corporation, a commercial art company he founded in the 1940s that specialized in educational comics. Operating as an independent contractor, Eisner from 1951 to 1972 produced PS Magazine, a publication for the U.S. Army that promoted preventive maintenance in the field that used a more visually-oriented approach to its subject matter, including comics and cartoons. 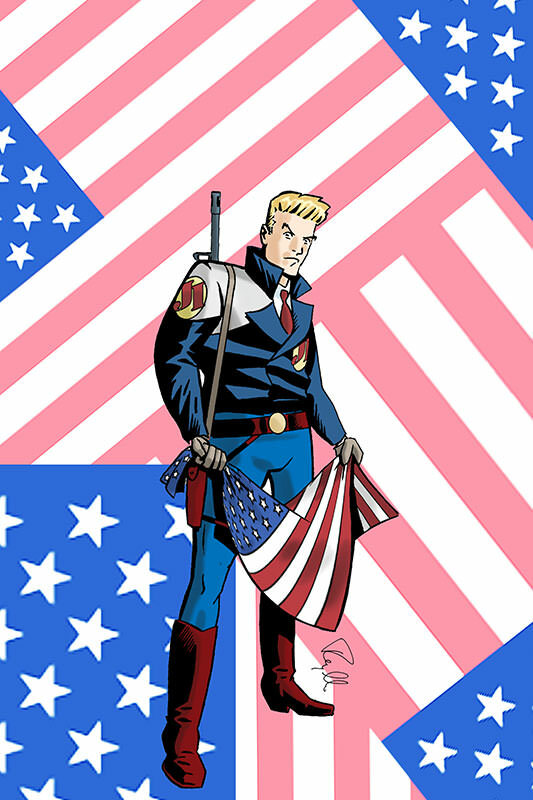 Created as an outgrowth of the work Eisner did during the war while he was in the service, one of the running characters Eisner created for the magazine was "Joe Dope," who served as an example of what not to do. (The Army supposedly partly ended the magazine after deciding that Dope was no longer the image it wanted to project of its personnel.) During his tenure, Eisner employed the talents of some of the best cartoonists in the business to work on the magazine. After selling American Visuals, Eisner began focusing on comics. While interest in the Spirit began to revive in the 1960s and '70s through various reprints by Harvey Comics, Kitchen Sink, and Warren Publications—which gave Eisner an opportunity to revisit the character through occasional new stories and cover art and pinups he provided—for the most part Eisner left the Spirit behind and began making good on his belief that comics were capable of serious artistic expression. The first product of that effort is his collection of short stories, A Contract with God, and other Tenement Stories (1978), considered one of the first modern-day graphic novels. Made up of a series of independent short stories—"A Contract With God", "The Super", "The Street Singer", and "Cookalein"—the book shared the common thread of taking place in the Bronx Jewish tenements of the 1930s. Though not an autobiography, the stories obviously drew on Eisner's background as the child of Jewish immigrants. (In later years, it become clear that the title story, "A Contract with God," reflected Eisner's personal trauma in dealing with the death of his daughter that many people were not aware of until the release of his biography, Will Eisner: A Spirited Life, by Bob Andelman). The stories reflect the kind of social realism that was occasionally apparent in Eisner's 1940s work in the Spirit. Having just discovered Eisner through the pages of Jules Feiffer's Great Comic Book Heroes, I recall being intrigued by an ad for A Contract with God (1978) and having my parents mail order it for me. It was unlike any "comic-book" I had ever seen, and made quite an impression on me—the book (a first edition by the original small publisher who released it, Baronet Publishing) became quite dog-eared from repeat readings. Adding to the book's period look was the fact that my edition was printed on sepia-toned paper and sepia inks. I recently re-read the stories and was delighted to find they still hold up and powerful today—they are still among his most effective work. Eisner's next project was "Signal from Space," which began being serialized in the Spirit Magazine around 1980, completing its run in its companion magazine Will Eisner Quarterly, both published by Kitchen Sink Press. 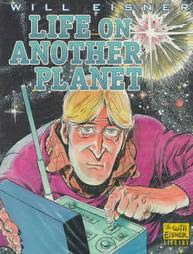 (It was later colored and collected as a graphic novel under the title, Life on Another Planet.) "Signal from Space" also made quite an impression on me because it was the first time I saw a straight thriller, with strong political overtones, done in comic-book format—in fact, I felt it was very similar to what I was trying to do with my own series. The format inspired me to create my own full-length 128-page Rob Hanes graphic novel thriller, Come Armageddon, done entirely in pencil in a sketchbook! These projects were soon followed by an incredible amount of activity, which was made possible by the attention Eisner's ambitious work was receiving. This new work, along with the legacy of the Spirit (Eisner was also involved in the very beginnings of the comic-book industry as one of the first "sweat shop" operators), had made Eisner one of the most respected "deans" of cartoonists, partly culminating with the prestigious Reuben Award from the National Cartoonists Society in 1988, and having the Will Eisner Comic Book Industry Awards at the San Diego Comic-Con named for him—an award that, as an active cartoonist, he received several times himself with some embarrassment and modesty. 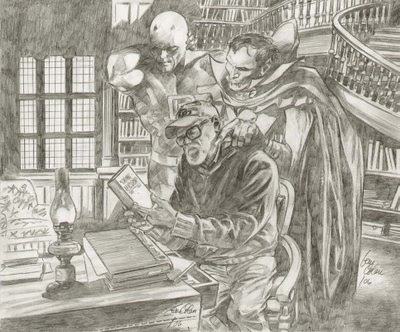 Eisner remained incredibly productive to his passing in 2005 at the age of 87. While the Spirit remains his most famous legacy, he clearly did not sit on his laurels, and remained interested in mining his personal experiences and interests in his comics. 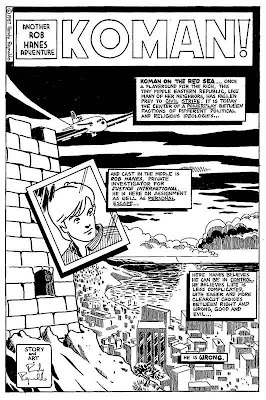 Among my favorite of his post-Spirit works are The Dreamer, a thinly-fictionalized story about his contributions to the beginnings of the comic-book industry leading up to his creation of the Spirit, and To the Heart of the Storm. Always committed to helping comics gain acceptance as an artform, Eisner also produced the groundbreaking and influential Comics and Sequential Art (1985), a treatise about the language of comics storytelling. The Spirit remains an important touchstone and inspiration for me, but I also wanted to give credit to Eisner's other body of work that also had a great impact on me. Note: Some of the factual information for this article was drawn from the Wikipedia entry on Will Eisner.